Boulder had a big year for murals and street art in 2018. This year we saw great projects commissioned by commercial developers, the launch of a new City-wide mural program, as well as exciting yet unauthorized street art, community wheatpaste installation and new murals in collective art spaces. We're thrilled that so many are stepping up to create opportunities for Artists to make their mark in Boulder. Here are ten of our favorite murals in alphabetical order from 2018, a monumetal year for public art in Boulder. Located at the Boulder Creative Collective. 2. “Creative Neighborhoods” 10 murals sponsored by the City’s Office of Arts & Culture. Featuring 10 murals by Sam Cikauskas, Susan Dailey & Eleanor Yates, Jason Garcia, Chris Huang, Brandy LeMae & Workshop8, Patrick Maxcy, Catherine Pistone, V. Ross, Tony Zellaha, and Lindee Zimmer. (all final photos not available at time of publishing). 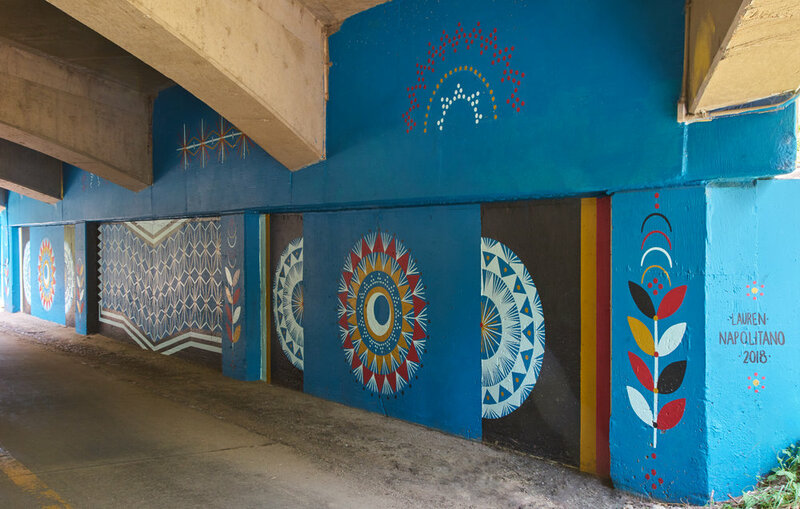 Commissioned by the City of Boulder located on the Boulder Creek Path, at the Arapahoe underpass (just west of Foothills). A private commission at 26th & Lloyd. “Buffalo on the Block” a commissioned project for an apartment building located on The Hill. “Orenda Project” a wheat paste installation at Martin Park celebrating local women, collaboration with Arts Martin Acres. “Emma Gonzalez mural” located in the “Root” alley on the Hill. “Owl” art located at 17th & Pearl and in North Boulder Park. Commercial commission, located at 28th & Arapahoe Safeway shopping center.